Summer is around the corner and now is the perfect time to schedule for exterior home maintenance. Our professional staff at American Deck Maintenance can help. Our cleaning and brightening process is the "Best in the Business", Our extensive knowledge of woods and sealers ensures your satisfaction. We use top quality sealers that do not contain wax. Most retail brand water sealers cost considerably less to make, are wax-like, and are only designed for short-term protection of your wood. Using the highest quality product is always the best choice, and ADMTM 2000 sealing system is that product. 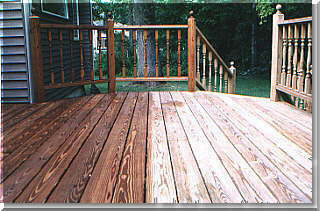 American Deck Maintenance's restoration process. Seal your deck so that it lasts for years...not just one season. American Deck Maintenance will clean, seal and maintain your deck so that it will remain protected for years to come, and our price guarantees the best value. In addition to decks, we also service fences, gazebos, concrete, walkways, driveways and homes. Copyright 2013 - 2000 American Deck Maintenance Inc.